For some time now, there has been some interest in performing chemistry experiments and the like at RevSpace, with PeterC having amassed a decent amount of glassware and chemicals over the past 2 years. Unfortunately, whereas we have stockpiled quite a fun assortment of chemicals, we are still missing a lot of glassware, equipment and above all a safe environment to do proper chemistry in. Project FumeHood will change this. 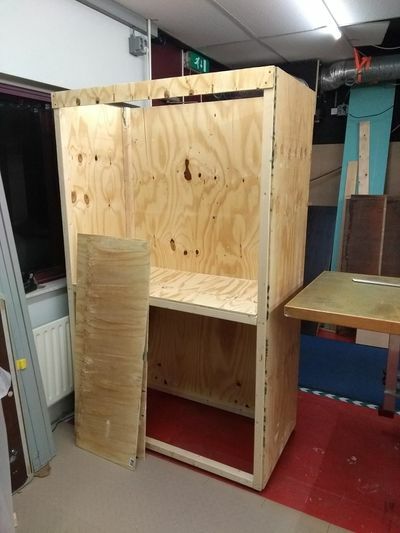 The fume hood will be located in the Werkplaats, right next to the exit, facing the lounge. 3 What are we going to do with the fume hood? Table has a 4cm lip to contain spills. Fire door. No automatic fire suppression. What are we going to do with the fume hood? very accurately record the positions of all the holes, we won't be able to see them through the gelcoat! gelcoat all the glass fibered surfaces. Don't forget the pigment paste! PeterC buy that glassware dude! I want to cook! Make a door for the cabinet, also maybe shelves? This page was last modified on 23 April 2018, at 15:01.